서울, Seoul : 고려원, Koreaone Press, 1993. 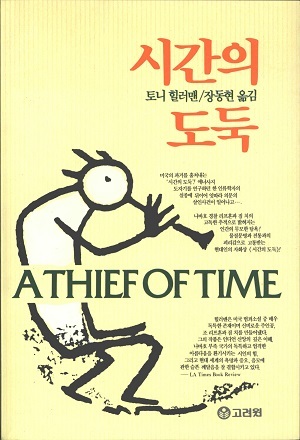 This is the first Korean edition of A Thief of Time. This edition was published in 1993 by Koreanone Press in Seoul, South Korea. The text was translated from Tony Hillerman's original English to Korean by Dong-Hyun Jang. The cover art is not credited but depicts the Kokopelli figures which is present on many covers from A Thief of Time. Included with this edition is a letter from the publisher and a decorative partial paper-wrap. Format: Paperback, 22.5 x 15.1 cm. Binding: Full-colored pasteboard covers with the image of a ceramic vessel, the title, the author, and the publisher's logo printed vertically on the spine.